Euro is the currency (money) of the countries in the eurozone. One euro is divided into 100 cent (officially) (singular) or "cents" (unofficially). Because of the number of different languages in the European Union, there are different, unofficial, names for this unit (the French call them "centimes" and the Spanish "céntimos", for example). It was created in 1999, but until 1 January 2002 it was used only for electronic payments. In 2002, 12 countries of the European Union (EU) got rid of their national currencies completely and adopted euro notes and coins as their only money. 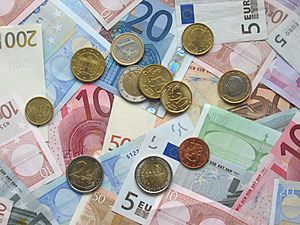 There was a change-over period, called the "transition period", when both the old national money and the euro were accepted, but by 28 February 2002, all 12 countries were using just euros. In 2007, Slovenia became the 13th country to use the euro. In 2008 Cyprus and Malta became the 14th and 15th countries to use the euro. In 2009, Slovakia became the 16th country to use the euro. In 2011, Estonia became the 17th country to use the euro. In 2014, Latvia became the 18th country and in 2015, Lithuania became the 19th country to use the euro. There are seven different banknotes, each one with a different colour, size and face value: €5 (grey), €10 (red), €20 (blue), €50 (orange), €100 (green), €200 (yellow), €500 (purple). Coins are of eight different amounts: €0.01, €0.02, €0.05, €0.10, €0.20, €0.50, €1, €2. On every banknote, there is a picture of a different European building style. All banknotes are the same throughout the entire eurozone - there are no different designs for different countries, unlike the euro coins. One side of each coin is the same in all euro countries. The other side is different since each country who mints the coins inserts a symbol relating to that country. Today there are many different sets of coins. Any of the coins can be used everywhere throughout the eurozone despite the country-specific symbol on the back. The ten new European countries that entered the European Union in May 2004 are planning to adopt the Euro also. First they must meet some conditions to show that they have stable economies. 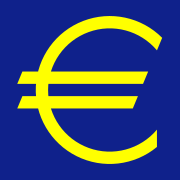 The symbol for the euro is the Greek letter epsilon (E) with two horizontal lines: €. Some people see it as the Latin capital letter C with an equal sign (=). It is also legal to simply write euro. This is especially useful when the symbol cannot be produced, or the result is not satisfactory. 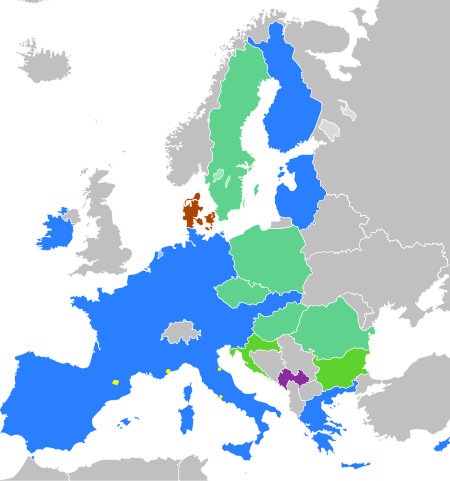 These countries form the Economic and Monetary Union (EMU). The European Central Bank has its seat in Frankfurt (Germany) and is in charge of the monetary policy of the euro area. The new banknotes were introduced in the beginning of 2013. The top half of the image shows the front side of the banknote and the bottom half shows the back side. 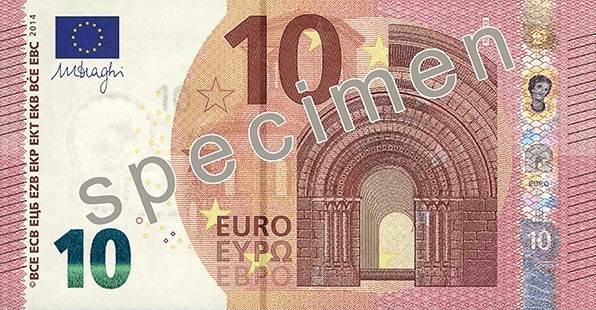 10 euro note from the new Europa series written in Latin (EURO) and Greek (ΕΥΡΩ) alphabets, but also in the Cyrillic (ЕВРО) alphabet, as a result of Bulgaria joining the European Union in 2007. 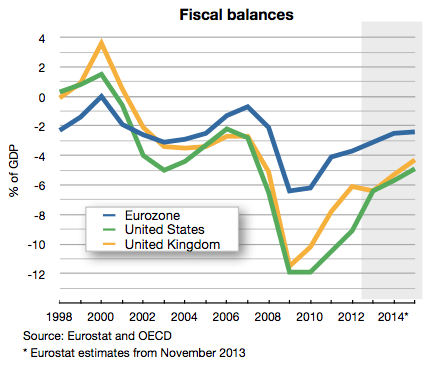 Budget deficit of the euro area compared to the United States and the UK. Euro-US Dollar exchange rate, starting from 2002. More recent information is available here. 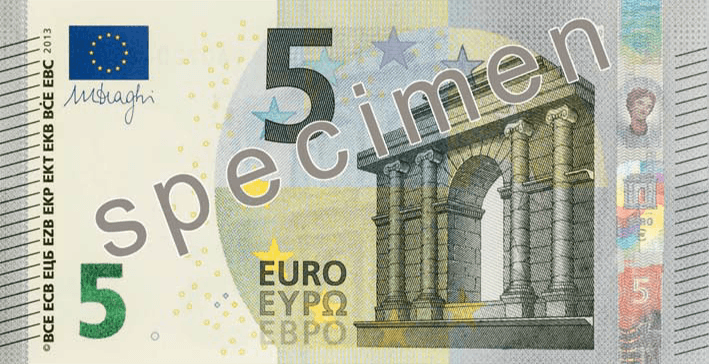 5 euro note from the new Europa series written in Latin (EURO) and Greek (ΕΥΡΩ) alphabets, but also in the Cyrillic (ЕВРО) alphabet, as a result of Bulgaria joining the European Union in 2007. Euro Facts for Kids. Kiddle Encyclopedia.